Woodland camping site FAQs. East Sussex campsite in the woods. Questions about our woodland camping site? Here’s some of the most common questions we get asked about our woodland camping site in East Sussex. If you can’t find the answer to your question here, please feel free to contact the office with anything we may have missed out. We try to make your woodland camping experience as enjoyable as possible to provide you with a relaxed, hassle-free break. 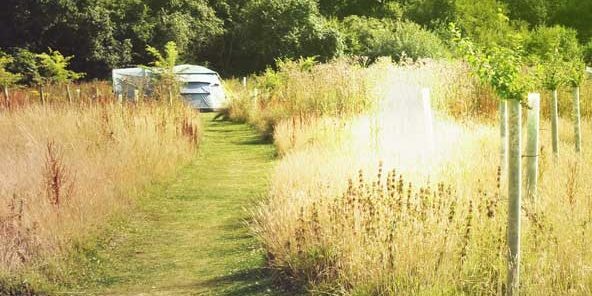 Our campsite is off-grid – so perfect for those campers looking to switch off and unwind in a beautiful part of the East Sussex countryside. Sorry we do not allow pets on the site or in our woodland. We love animals but due to the woodland’s natural wildlife we can’t allow pets. We have areas for car parking. Cars may not be driven to your pitch or into the camping areas. We aim to provide camping in the woods not in a car park. Wheelbarrows are provided to move your equipment to the pitch. Pitches vary from 60-300 metres. It may be a five-minute walk – but it’s worth it once you set up not to have cars in the campsite. Much safer for kids as well! There is a shop in Netherfield (about 1 mile). There are also a wide variety of shops in the town of Battle (3 miles). How do we cook and store food in the bell tents? With our own bell tents we provide a wood burning cooking stove with our ‘posh camping’ bell tents. Each pitch has a fire pit, and we provide a grill to BBQ and cook on. A cool box is provided for each bell tent but if you want to keep a lot of food and drink cold please bring additional cool boxes. Sometimes it’s a good idea to freeze your second day’s food so it keeps everything else cold as it thaws out. Local stores sell ice if you do need it. Camping wouldn’t be camping without a campfire. For essential info check out how to build a campfire, and for cooking inspiration, read our section on campfire cooking. We ask all campers not to collect any firewood and only to use wood supplied by us, or that you have brought either from home or from another sustainable supplier. Fallen branches and decaying trees help to maintain a healthy and vibrant ecosystem which enhance your interactions with nature. Can I smoke on the campsite? No smoking is allowed inside our bell tents or within campsite facilities. However you are welcome to smoke around the campsite – please be careful to avoid the risk of fire in our woodland. There are lots of great pubs close by. These include The White Hart Inn, The Netherfield Arms and The Squirrel Inn. All are walking distance of about a mile or a mile and a half. We have maps to guide you through the Estate and the woodland to find them – walks of 30-55 minutes. Can I get to The Secret Campsite Beech Estate without driving? Yes, the nearest station is Battle. A taxi will cost around £8-12. (Distance is 3.5 miles and takes 7-10 minutes). We do not allow radios, percussion instruments or any kind of amplified music. A quiet guitar and acoustic instruments are acceptable until our 10pm chill out time, after which we ask you to keep the noise down and relax around your fire. How far are you from London? The Secret Campsite Beech Estate is approximately 65 miles from London which is roughly a one-and-a-half-hour drive via the A2 and A21. How do I reach the The Secret Campsite Beech Estate? Arrival times for Bell Tents are between 3:00 pm and 8:00 pm. Arrival times for Tent Pitches are between 2:00 pm and 8:00 pm. Please let us know if you expect to arrive late or are delayed. The Bell Tents and Tent Pitches must be vacated by 11:00 am on the departure date. We take full payment at the time of booking. Our online booking system is live and you can book all of the accommodation via the website. Are your Bell Tents considered ‘glamping’ or ‘posh camping'? We prefer to call it ‘wild glamping’. We don’t want to provide hotel rooms pretending to be camping. It’s real camping – away from power sources and it’s off-grid. We in fact provide very comfortable, clean, pre-erected tents, kitted out with the equipment you will need to experience real camping. So, we think it’s ‘posh camping’ – but in our unique real, off-grid in the woods style! We have both ‘wild glamping’ or ‘posh camping’ as well as BYO tent camping with our forest tent pitches, faraway tent pitches and larger group areas. What should I bring for the Bell Tents? We recommend you bring towels, tea towel, a duvet or sleeping bags, a bottom sheet for the beds, pillows and pillow cases. Toiletries and insect repellant. Food and drink. Newspaper for the fire. A bag to take away your rubbish. A torch or two would be useful (and a few tea lights to create the right mood!). Well it wouldn’t be posh camping if we didn’t have flushing toilets – we have four of them. Plus we still have some great eco compost toilets scattered around the campsite, which are just like a normal toilet, with a seat, but no flush. We provide wood shavings and sawdust to scatter down – fragrant and clean! Our campsite has over twice the number of toilets recommended for campsites their size (in fact, we have nine toilets against the license requirement of three). We have seven of our unique, quirky, custom-built, private bucket showers made from reclaimed timber – we really hate standing line for a shower! They have aerial views of the surrounding trees, and are big enough to allow parents to shower with children. You just transfer a bucket of water into the shower bucket and hey presto it works just like at home. The water for the bucket showers is heated from gas water heaters or if you have a fire going you can help the environment and boil your kettle. Yes – our campsite has gas hot water systems. Great for the environment to try heating your shower or washing up water on the fire using the latent heat if you are using one to cook! Do you have a restaurant or cafe? We are a woodland campsite! But we have lovely pubs and restaurants within walking distance or a short drive from the campsite – see our Eat & Drink guide.